Today we’re finishing the basic structure of the dress and later we’ll move on to the final details. First pin and stitch the sleeve seam. Easy peasy, right? With the sleeve right side out slip the sleeve inside the bodice through the armhole. Match up the bodice side seam to the sleeve seam. Match up all notches and center dot to shoulder seam. See, it’s just like a woven set in sleeve! 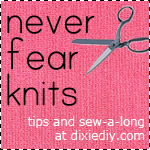 The one thing that’s different is that because knits are stretchy it makes it so much easier to ease the sleeve in. I know I tell you not to stretch knit fabric when sewing but this is the one minor exception. You can stretch the fabric but only until it just fits. If you are having trouble you can always baste the top of the sleeve between notches for some extra stability while easing. You can also use a bunch of pins to make sure the fabric is evenly spaced. Stitch the sleeve to the bodice and gently stretch the armhole to match the sleeve curve. Repeat for the other sleeve. Now, I want you to try the bodice on and see how it fits. You might notice that the top seems a little short. No worries – when we add the skirt the weight of the fabric will help pull the bodice down. But if it feels good across the bust line then we’re in business. Cut a length of elastic that matches the circumference of the bodice’s waistline, plus a little overlap. Next, with right sides facing, pin the bodice to the skirt. Put the fabric under the presser foot with the wrong side of the bodice facing up. Slip the elastic under the foot and line up the elastic with the edge of the fabric. With some scraps you could do a tension test on your machine before you sew. Stitch your waist seam. Because the elastic matches the waist measurement you don’t have to stretch the elastic as you sew. The end of the elastic will overlap when you reach the starting point. Back stitch here or slide off if you are using a serger. If you are using a sewing machine remember to trim your threads. If using a serger knot and snip off the strings on the waist and armholes. Ok, I wanted to let you know that there is another way to attach the sleeves to the bodice but I didn’t want to use it because beginners might find it difficult to match up the armhole and side seams, and the traditional way of doing set in sleeves is more familiar. But here’s the trick: First stitch the bodice shoulder seams. Next pin the sleeve to the armhole opening (right sides together) and stitch. Finally pin your side seams and sleeve seams and stitch all the way from the wrist opening down the side to the bottom of the bodice. ***Yay! Now the body of the dress is complete! I’m taking the day off tomorrow but on Friday we’ll finish with some twin needle hems and the collar attachment. This is a pretty short sew-a-long, I realize, but since this is a beginner level pattern I hope you don’t mind the speed.